Toshiba’s Thrive is their first 10.1 inch Android Honeycomb tablet, it’s a great tablet a reasonable price available at Amazon starting for $368. If you waited on a how-to root than the waiting is over. Over at XDA Developers the forum member dalepl created a rooting script for Linux and DOS. 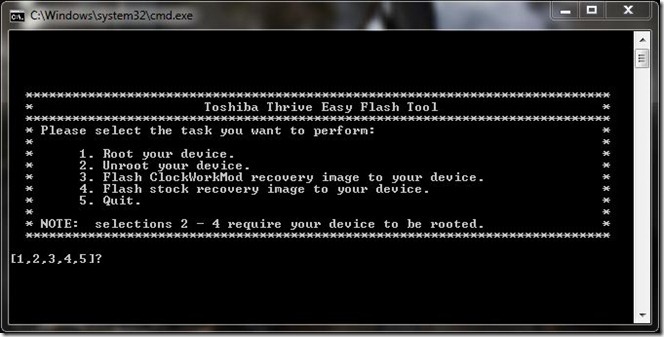 Probably the easiest way to root your Toshiba Thrive. The tool will work for you if you have updated to 0029 or 0032. Cool is, the script lets you un-root your Thrive (Version 0029 only) as well. In addition ClockworkMod recovery will also be installed using the Windows Script. Not yet using on Mac or Linux. WARNING: This is for 0029 and 0032 only. This tool can be used to root the current 0032 load and unroot the 0029 load so you can load the 0032 update. Your WiFi will no longer work if you flash the wrong boot image with any system image, so if you have 0029 and want to root, you have to use the 0029 rooted boot image and if you have 0032 you have to use the 0032 rooted boot image. Also, WinXP users cannot use the current tool to root/unroot thier device. WinXP does NOT support the full scripting commands that are used to create the menus in the current tool. Please follow this guide at your own risk. Addictive Tips will not be liable if your device gets damaged or bricked during the process. On Windows you need to have the ADB Drivers installed. In the Readme file you will find the Instructions for driver installation in the root package. Download the root package and verify that the ADB drivers you installed are working. Once you see your Thrive is connected proceed with verifying that the fastboot drivers are working, by booting into fastboot. (How do I fastboot? If your device rebooted, your drivers are properly functioning. Time to work with the script now. To do that, make sure your device is in fastboot mode. When you are in fastboot, run toshiba_easy_flash_tool.bat for Windows, and if you’re on Linux or Mac, run root.sh to root the device. To unroot it run unroot.sh. Type in the relevant keys for you requirements and the tool will take you from here. Thats’ it, your done! If your looking for updates or more information to this tool, visit the forum thread at XDA-Developers, ThriveForums (Windows) and ThriveForums (Linux/Mac). Your one year free trial webhosting has arrived at,please check it.